Erin McKiernan works for an institution that would stand to save substantial funds if the scientific literature were made freely available. The opinions expressed herein are those of the author, and not necessarily those of the National Institute of Public Health or the Secretary of Health of Mexico. His eyes brighten and his voice rises as he tells me about his latest results. He is excited. He should be. His lab is unravelling the details of how new memories are formed in the brain. Then I ask him where he will be publishing the work. He deflates. And begins to recite a formula I have heard before: “Well, we submitted the paper to Nature Neuroscience, but it was rejected. Then, we sent it to Neuron – rejected again. Next, we are thinking of sending it to PNAS. If that doesn’t work, we’ll probably send it to the Journal of Neuroscience.” Down the glamour publication ladder we go. This is not the first time I have had this conversation with a fellow neuroscientist. And it likely won’t be the last. We live in exciting times, when new technologies are changing the way we see the brain, revealing greater complexity and plasticity. We are learning more about neuropsychiatric disorders like schizophrenia and neurodegenerative diseases like Alzheimer’s. But instead of sharing all this new information with anyone interested, or in need, it is packaged up and shipped off to journals that only a small percentage of the population can access. As with many scientific fields, the majority of journals publishing neuroscience research are subscription-based. Individuals wanting to read their contents must pay to receive access. Academic institutions must do the same, purchasing annual subscriptions that can cost up to $40,000 for a single journal. Even some of the most wealthy universities, such as Harvard, have said they can no longer afford rising journal subscription fees. The last decade has seen great advances in open access publishing. But opening up the field of neuroscience has been slow and there is still a long way to go. A search of PubMed articles using the terms “neuroscience” or “brain” reveals that until 2010 less than 10% of articles were published in open access journals, or in hybrid subscription journals that offer an open access option, under licenses that allow for redistribution and reuse. The percentage is increasing, but as of 2012 it was only at 18%. Admittedly, 18% underestimates the total percentage of neuroscience articles freely available on the web. Many subscription journals now allow authors to post preprints or peer-reviewed versions of their articles on personal websites or online repositories (often called green open access), or allow for cost-free access to journal volumes after six to twelve months. What percentage of the neuroscience literature is made freely available through such routes? It is not clear. 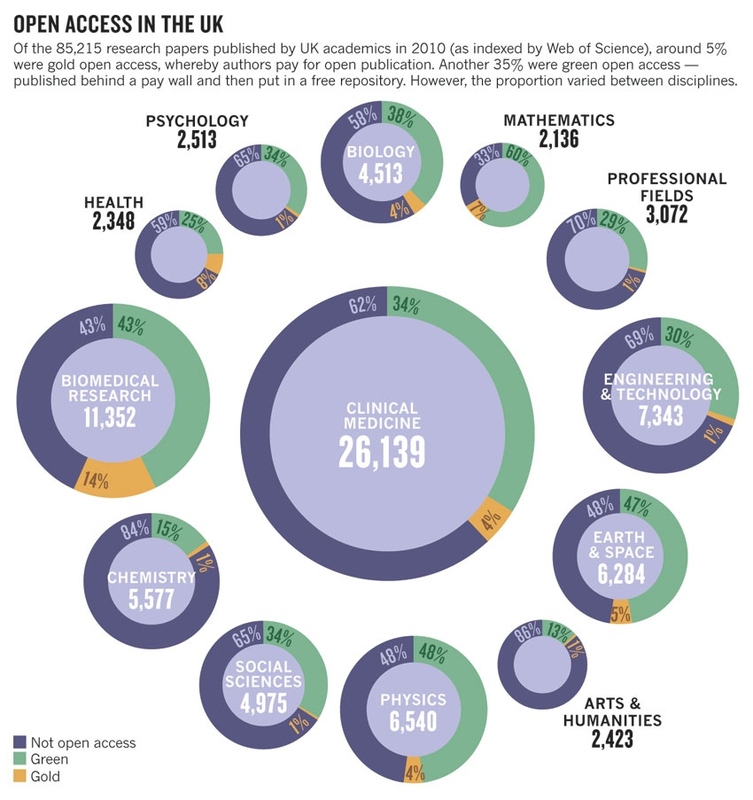 But data from related fields like psychology or biomedical research estimate that between 13% and 43% of the literature is made available through green open access. In contrast, in mathematics the estimate is between 45% and 60%. Unfortunately, whereas fields such as mathematics and physics have a strong preprint culture and often use repositories such as arXiv to share work, this culture is not as strong in the biological sciences. In 2003, arXiv introduced a “quantitative biology” (q-bio) research area, which includes a “neurons and cognition” category. But nearly a decade later, submissions to q-bio accounted for just over 1% of all submissions, whereas submissions to “mathematics” accounted for nearly 26%. New submissions per year in “mathematics” are in the tens of thousands, while those in q-bio and specifically “neurons and cognition” are in the low hundreds. In 2007, Nature Publishing Group (NPG) launched a preprint server called Nature Precedings specifically for researchers in the biological sciences. But only five years later, it was shut down because it was “unsustainable as it was originally conceived”. Viable alternatives have emerged, including Figshare and most recently PeerJ Preprints. A few neuroscientists have begun posting their work. However, it remains to be seen whether the whole field embraces sharing research through these venues. Sometimes sharing requires a push. In 2008, the National Institutes of Health mandated that all articles arising from NIH funded research be made publicly available through PubMed Central (PMC) within 12 months of publication. Articles can be deposited by authors, institutions and publishers. This policy has been instrumental in increasing access to the neuroscience literature, and many argue it decreases the need for open access publishing. But there’s several reasons why PMC is not enough. First, not all neuroscience research is funded by NIH and subject to the mandate. Second, in this fast-moving field, one year is still a long time to wait to have access to new information. Third, compliance with NIH’s policy only hit 80% this year. And what PMC does is not truly open access. By “open access” to this literature, we mean its free availability on the public internet, permitting any users to read, download, copy, distribute, print, search, or link to the full texts of these articles, crawl them for indexing, pass them as data to software, or use them for any other lawful purpose, without financial, legal, or technical barriers. Articles which are published through subscription journals and later archived meet the condition of free availability, but often have restrictions placed on their redistribution and reuse by publishers who hold copyright. So, while a larger percentage of the neuroscience literature may be free, 18% is likely a more accurate estimate of how much of that literature is compliant to standards set by BOAI. Why aren’t more neuroscientists publishing in open access journals? It is certainly not that the publishing venues don’t exist. A current search of the Directory of Open Access Journals reveals 68 journals with “neuroscience” in the title (and many more with less specific titles but publishing relevant research) 30 of these 68 journals publish articles under some type of Creative Commons license and 15 use the least restrictive and fully BOAI-compliant license. 35 of these journals charge a publishing fee to authors, but many provide waivers. And 26 journals charge no fee. Unfortunately, some open access journals in neuroscience are having a tough time bringing in authors. In January 2011, the open access publisher BioMed Central launched a new journal called Neural Systems and Circuits. The journal editors had a vision: a venue for strong experimental and theoretical work on some of the hottest current topics in neuroscience. But in October 2012, the journal closed its doors, with editors citing a shortage of submissions and a lack of “support from the community”. So which journals are the neuroscience community supporting? Centralised data on submission rates are not available, but citation data are. A look at citation flow to and from neuroscience journals ranked by Eigen factor reveals, not surprisingly, that the main nodes are subscription journals such as Nature, Neuron, PNAS, and Science. Ranking journals by Impact Factor – a flawed but unfortunately widely-used measure – reveals similar results. Many neuroscientists are told early in their training that they must publish in high Impact Factor subscription journals to be successful in the field. The message is not just “publish or perish”, but rather “lock up your research or perish”. This message must change. Hiring and tenure committees must stop giving weight to the journal in which research appears, and focus instead on assessing the quality of the work itself. We must ask authors to stand up for their views on open access, and we must be ready to support them when they do. Otherwise, the secrets we unlock about the brain will simply be locked up again, this time behind paywalls.